I’m adding a new book to my Favorites Page today after finishing Annie Barrows’s latest work, The Truth According to Us. This is hands down the best book I’ve read this summer and possibly this whole year. Seriously, it was so good, I’m in a book hangover right now because I just can’t move on. You may remember Annie Barrows from her co-authorship of The Guernsey Literary and Potato Peel Pie Society, another book I dearly love. The Truth According to Us is only similar in the strength of character and setting. Otherwise, it has a whole ‘nother feel and plot to it. In fact, it rings more of Kathryn Stockett’s The Help in style and is almost as compelling, if not equally so. 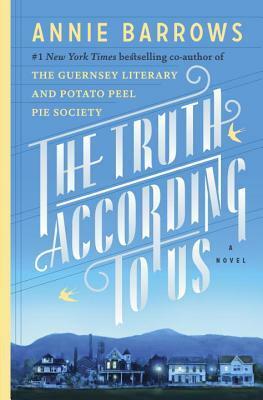 The Truth According to Us is set in the small factory town of Macedonia, West Virginia in 1939. Layla Beck, a fiesty socialite, falls out of her father’s good graces and finds herself in the Federal Writer’s Project with the job of writing the history of Macedonia. Beck gets much more than the back country, backwards society she bargained for when she lands a boarding room in the house of the Romeyn family. As the book progresses, it turns out that the Romeyn family is the true heart of the book. There are secrets upon secrets that shape this family, but this isn’t a soap opera story. It’s more like a classic family saga in which the characters seem to live and breathe in your mind and the story is wrenching and gripping even though it’s not your own and has nothing much to do with your life at all. Under it all is this idea that history and the course our lives take is always based on what we believe is true. Though definitely not a morality story meant to drive home a particular point, I couldn’t help but think of how important it is to surround ourselves with truly trustworthy people. Trusting the wrong person can change everything about a person’s life. I can’t say too much more or I’ll give it all away! I think this is the type of book that will span many genres and reader preferences. Grab a copy and get reading! Thanks for passing on this ‘must read’! Will definitely get to this one before the summer ends. Glad I can go to you for good reviews and reap the rewards! Next post What Books Become Part of Your Life?